Velier are an Italian rum firm, well known for sourcing some of the very finest rums in the world. This is one such bottling. 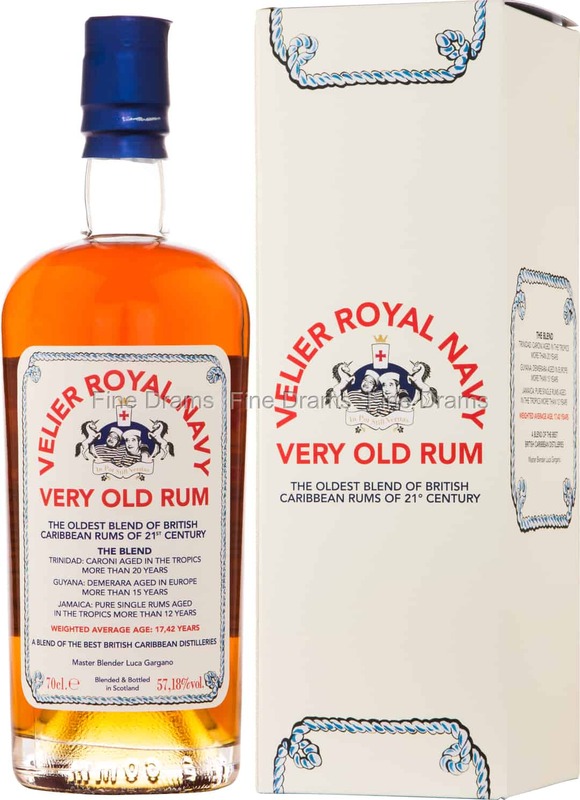 A ‘Royal Navy’ rum, this is no relation to either the British or Italian navies, but rather refers to the dark, sweet Guyanese-based style of rum that was used at sea. This is a premium rum, with an average age of over 17 years. Indeed, the blend contains spirit from some highly esteemed distilleries from across the Caribbean. From Trinidad comes Caroni rum aged for more than 20 years “in the tropics”, which is an astonishing maturation considering the climate of the Caribbean. Demerara rum from Guyana is aged for 15 years in Europe, whilst Jamaican “pure single rums” older than 12 years complete the blend. The bottling is carefully overseen by Velier’s Master Blender Luca Gargano. The result is an astonishingly dense and warming rum is outstanding complexity. Drinkers can expect classic Caroni flavours of tarry molasses and tobacco, followed by Jamiacan funk, coconut, bananas, chocolate, coffee, dry oak, lemon zest, ginger, stone fruit and oat biscuits. Bottled at a powerful 57.18% ABV, this is an intense and delicious rum experience. Velier have once again produced an unique and distinctive rum.